I casted on six times. And ripped it out six times. Failure. Six times. Gah. It was time to try a different pattern. A lush-ious one. And once I did, all was right in the knitting world again. 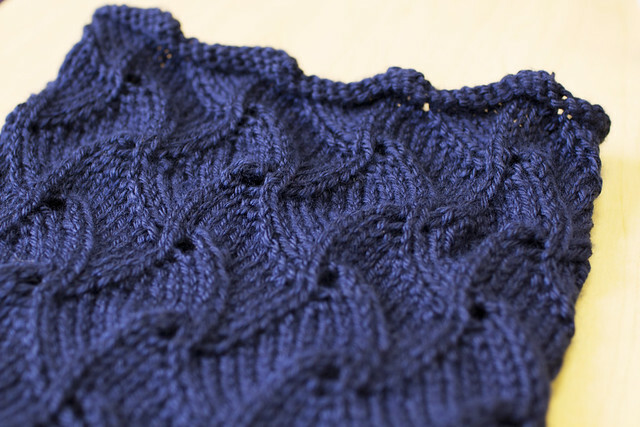 The swirl cowl had been in my queue for months. The admiral navy blue yarn had also been in my possession for months. The two were married in late February and a beautiful union it is. Together, they have movement, like waves, but still soft and warm enough to make any neck delightful. The blue waves have made their way to Baltimore to keep the lovely Wendipants a little warmer. I’m always so happy to hear that I made someone’s day a little brighter. *Pattern: Lush-ious Swirl Cowl by Linda Frydl, free download on Ravelry.com. Wendi @ Bon Appetit Hon - As the recipient of this beauty, I can say that your work is high five worthy. Thanks to the wonky weather we’ve had this winter, I’ve had a chance to get to know these waves…and I intend to wear the hell outta them. You absolutely made my day brighter! amanda - Brooke, that is gorgeous! The color and texture are perfect :) Way to go! Love that color. So gorgeous!